Portosystemic shunts are the most common hepatobiliary congenital abnormality diagnosed in veterinary medicine. When a portosystemic shunt is present, the portal circulation enters directly into the systemic circulation, bypassing the hepatic sinusoids and parenchyma. In a growing animal, this lack of hepatic circulation leads to poor hepatic development, altered fat and protein metabolism, and can ultimately lead to hepatic failure. Congenital extrahepatic portosystemic shunts (EHPSS) are seen most commonly in small breed dogs (e.g. Yorkshire Terrier, Maltese). The shunting vessel is usually solitary, arises from the extrahepatic portal vein and shunts portal blood ﬂow to the caudal vena cava, azygous vein, or left gastric vein. Congenital intrahepatic portosystemic shunts (IHPSS) are seen most commonly in large breed dogs (e.g. Labrador Retriever, Australian Cattle Dog, Irish Wolfhound). With intrahepatic shunts there is a large anomalous vessel originating of the main portal vein and shunting portal blood ﬂow into the intrahepatic caudal vena cava. IHPSS are subdivided into right, left or central divisional based on anatomic position. Left divisional IHPSS are the most common, and are attributed to lack of closure of the patent ductus venosus, which is vital to fetal circulation and normally closes 2-6 days after birth. Acquired portosystemic shunts are secondary to an underlying hepatic disease process and the development of portal hypertension. Acquired shunting usually involves multiple vessels, and ultimately medical management is the only option in these patients. Dogs with congenital portosystemic shunts typically present with clinical signs between 1-2 years of age. Patients present with small stature and behavioral changes, and may have a history of prolonged recovery from anesthesia. In detailed discussion with owners, additional clinical signs may become evident. Gastrointestinal (GI) signs are variable and include vomiting, diarrhea or pica. GI bleeding can be seen, and is more common with intrahepatic shunts. Patients may present with abdominal effusion, which is likely related to low oncotic pressure from low serum albumin and is exacerbated by concurrent gastrointestinal disease. Lower urinary tract signs can also be seen and are attributed ammonium urate stones, that are more likely to form due to increased ammonia blood concentrations, and infections. 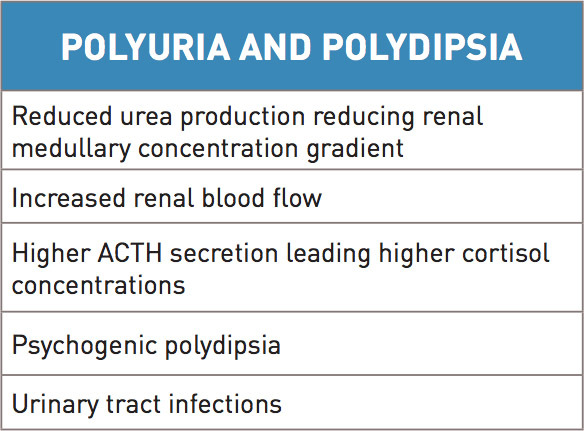 Polyuria and polydipsia may be noted in association with infection however other underlying causes have also been identiﬁed (Table 1). Hepatic encephalopathy is a signﬁcant complication to chronic liver dysfunction. This occurs when over 70% of liver function is abnormal. Due to liver dysfunction, there is reduced ﬁltration of neurotoxic substances that are absorbed normally across the GI barrier. Examples of these neurotoxic substances are ammonia, tryptophan, glutamine, gamma- aminobutyric acid (GABA). These substances damage neuronal function, in particular astrocyte function. After being produced by gut ﬂora and absorbed from the GI tract, neurotoxins are normally converted to urea in the liver. With portosystemic shunts, this conversion does not take place and excess ammonia builds in the blood stream. Signs associated with hepatic encephalopathy may be more signiﬁcant after an ingestion of a meal. Ammonia is implicated in causing increased release of glutamate, an excitatory neurotransmitter in the brain, leading to seizures. With chronic liver dysfunction, inhibitory factors, such as GABA, start to predominate above the excitatory factors and cause signs of CNS depression and coma. In addition to psychogenic polydipsia, other signs consistent with hepatic encephalopathy can vary significantly from ataxia, to head pressing, to blindness and seizures. As a next step in evaluation for portosystemic shunt abnormalities, baseline blood work and urine testing can provide some general information. A mild to moderate microcytic and normochromic anemia can be diagnosed, likely related to abnormal iron metabolism. Target cells are commonly noted on blood smear evaluation. Leukocytosis is noted in some dogs and can be associated with a poor prognosis. On chemistry evaluation liver function parameters are often found to be at the low end of normal or below normal. These include urea nitrogen, albumin, cholesterol, and glucose. Liver enzymes, specifically ALT and ALP, can be mild to moderately elevated. 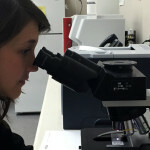 Urine testing shows hyposthenuria or isosthenuria, secondary to polydipsia and polyuria. Ammonium biurate crystalluria may be documented, likely related to increased uric acid. Proteinuria is seen related to glomerular sclerosis or other glomerulopathy. In people, this has been noted to be associated with a greater amount of antigens reaching the kidneys. Clotting times are elevated in only about 20% of animals and lower platelet counts may be noted in some patients. Liver function testing helps raise signiﬁcant suspicion for the diagnosis of portosystemic shunt. Bile acid testing is a measure of bile acid blood concentration, and measures the ability of the liver to be able to absorb bile acids after being reabsorbed from the GI tract. Paired bile acids (fasted and postprandial) measurement aids in maximizing sensitivity of this testing. Premature gall bladder contraction can affect the blood results. In the Maltese breed, mild false positives without signiﬁcant hepatic pathology can occur, which means mild elevated bile acid testing should be interpreted with caution in this breed. False positive test results can also be seen in other situations such as phenobarbital or glucocorticoid administration, inappropriate sample timing, or in the presence of other concurrent hepatobiliary disease. False negative testing is also possible in relation to lack of adequate food intake, lack of gall bladder emptying, inappropriate sample timing or GI malabsorption. Ammonia blood concentrations can be used to help in diagnosing liver dysfunction but testing needs to completed ideally within a short time of collection of blood. Ammonia tolerance testing may be dangerous and is often contraindicated as it may exacerbate hepatic encephalopathy. As a last option to evaluate liver function, Protein C measurement may be a consideration. Protein C is a Vitamin K dependent anticoagulant protein that is important in maintenance of hemostatic balance as well as protection against thromboembolism. In animals with congenital or acquired portosystemic shunting, the activity of Protein C is signiﬁcantly lower as compared to dogs that have other conditions affecting liver function such as microvascular dysplasia. This blood test can also be used as a parameter after surgery with higher protein C levels indicating improved hepatic perfusion. Abdominal radiographs performed on patients with portosystemic shunts may demonstrate microhepatia, renomegaly, reduced serosal detail, and/or rarely cystic calculi. Variable ﬁndings of ileus or abdominal distention can also be seen. Reduced serosal detail is attributed to thin body condition, abdominal effusion, summation of intestine and adjacent structures. Urate cystic calculi are more commonly radiolucent and require ultrasound or contrast cystography for diagnosis. Ultrasound examination is highly sensitive and speciﬁc for the detection of portosystemic shunts (Fig. 1). Ultrasound exam may conﬁrm the radiographic ﬁndings, as well as elucidate the shunt vessel and other abnormalities of the vasculature. Portal vein examination may show the origination of the anomalous vessel, and/or a reduced diameter at the porta hepatis with EHPSS. Caudal vena caval examination may show turbulent ﬂow at the shunt anastomosis, and/or increased caval diameter with both EHPSS and IHPSS. Fig. 1: Ultrasound images of left divisional intrahepatic portosystemic shunt in a golden retriever. Fig. 2: Computed tomography image of a left divisional intrahepatic portosystemic shunt in a Golden Retriever. If the shunt morphology cannot be fully determined from ultrasound alone, or when presence of a shunt is highly suspected, but not visualized ultrasonographically, portography with CT or MRI can be performed. These advanced imaging techniques provide greater speciﬁcity for detection of an anomalous vessel, and the opportunity for a 3-D reconstruction display of shunt anatomy. CT-portography is instrumental in the planning of interventional treatment options (Fig. 2). In certain cases, emergency medical management (Table 2) has to be administered to patients with portosystemic shunts that present with seizures or marked mental dullness. 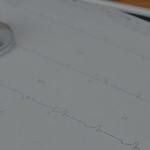 The immediate goal in these patients is to control clinical signs. Cleansing enemas with lactulose can be administered. Flumazenil can be used to help treat for endogenous benzodiazepines that may be exacerbating hepatic encephalopathy. Seizure control may need to be initiated with midazolam or phenobarbital however potassium bromide or levetiracitam may be a better choice when possible, due to lack of hepatic effects. With ﬂuid management, it is suggested that lactated ringers should be avoided as there is reduced conversion of lactate to bicarbonate by the liver, and the higher lactate concentration is likely to worsen acidosis. 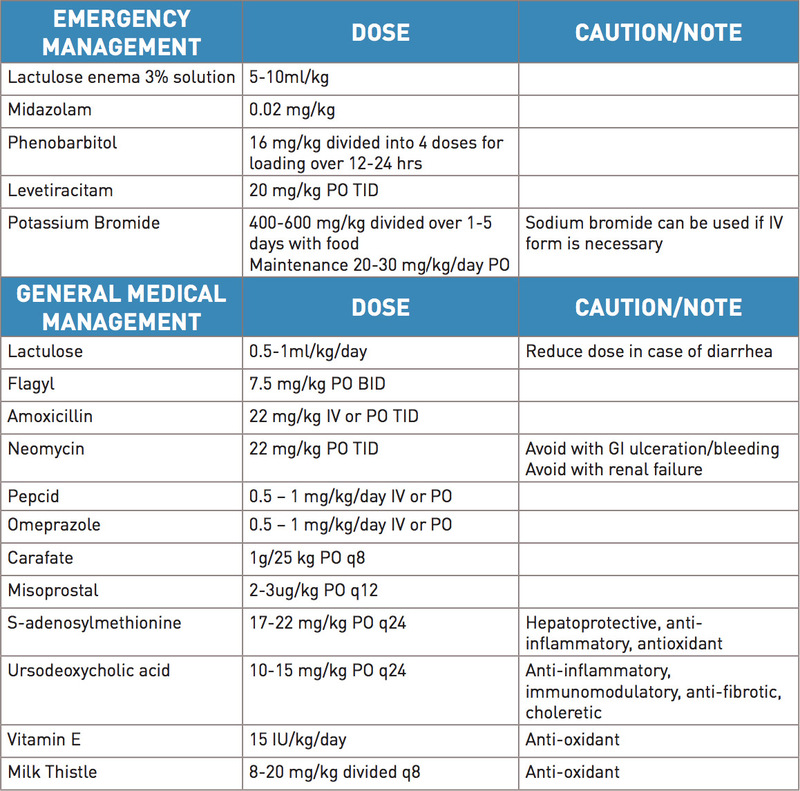 Lastly, increased potassium supplementation needs to be considered alongside ﬂuid therapy for these patients due to chronic diarrhea or decreased intake. Lactulose is used in acute and chronic management of liver dysfunction to help control ammonia concentrations that are contributing to hepatic encephalopathy. It is metabolized by colonic bacteria to organic acids, making a more acidic environment in the colon, allowing trapping of ammonia as ammonium. Lactulose also decreases bacterial numbers in the colon and acts as an osmotic, which reduces stool transit time, therefore allowing for reduced overall ammonia production. In addition to lactulose, antibiotics (e.g. Flagyl, Amoxicillin, Neomycin) can be used to help reduce bacterial numbers in the colon and thereby again, reduce production of ammonia. Antacids are recommended for patients with portosystemic shunts due to their propensity to develop gastrointestinal ulcers. This is especially true in intrahepatic shunts as there is a higher predisposition to gastrointestinal ulcers in this subset of patients. Pathophysiology for the cause of this is not completely understood. Considerations include abnormal blood ﬂ ow in the intestine, hypoprostoglandinemia, poor mucosal integrity, abnormal mucous production and abnormal cell turnover of cells in the intestine. In the past it was speculated that high gastrin blood levels (due to reduced clearance from lack of liver function) would predispose to a higher acid environment in the stomach and therefore predispose to gastric ulcers – this however appears less likely. In addition to medical management, both supplements and nutritional changes are recommended. Diets should be easily digestible, and consist of high quality protein in a reduced protein content diet. It is important to maintain palatability to help encourage food consumption, as these patients are often in poor body condition. Supplements (e.g. milk thistle, S-adenosylmethionine, Vitamin E, ursodeoxycholic acid) should be used, especially with chronic management. These supplements are hepatoprotective, with anti-inﬂammatory and anti-oxidant properties. Patients with intrahepatic and extrahepatic portosystemic shunts should be stabilized before a shunt attenuation procedure is performed. Management of clinical signs, resolution of severe hepatic encephalopathy, and weight gain is recommended. The need for presurgical management with anti-convulsants is debated, and consultation with the acting surgeon is recommended. For anesthesia there are certain considerations that should be evaluated. Major tranquilizers (e.g. acepromazine) should be avoided. Dextrose supplementation will likely be necessary as liver function is signiﬁcantly reduced and thus glucose storage is reduced. In addition, plasma and Vetstarch may be needed for colloidal support. At the time of surgical or interventional evaluation, monitoring of portal pressure is necessary to help avoid post-operative complications. Portal hypertension is likely if the absolute pressure is greater than 17-24 cmH2O or if pressure ends up above 9-10 cmH2O above baseline portal pressure. Evaluation of the gradient between portal pressure and central venous pressure is also important to minimize the risk of complications. Acute portal hypertension is an emergent condition that leads to ascites with intestinal congestion and hypoxia, resulting in vomiting, diarrhea, septic shock and death. Chronic portal hypertension develops when in hepatic regeneration the portal vasculature fails to develop in response to shunt attenuation. Acquired multiple portosystemic shunts are the sequela to chronic portal hypertension. Slower attenuation devices have decreased the occurrence of portal hypertension following shunt attenuation. Fig. 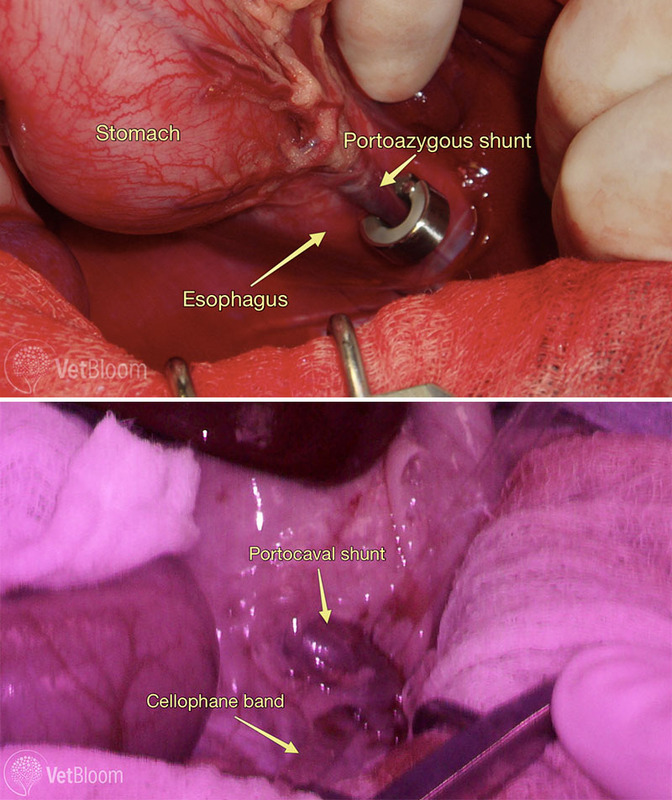 3: Intra-operative photos showing an ameroid ring around a portoazygous shunt (top) and a cellophane band being placed around a portocaval shunt (bottom). The cellophone band is the linear clear structure running from the tio right to the middle bottom of the image. Images courtesy of Lisa Corti, DVM, DACVS, CCRP. For extrahepatic shunts numerous devices have been employed. In the past, silk was used but complete attenuation was not guaranteed. Silk was easy to handle, inﬂammatory and non-absorbable. In more recent years, gradual occlusion devices have been used to allow for more reliable and progressive occlusion of shunt ﬂow, decreasing the development of portal hypertension. Reduced surgical time has also been documented with these devices. Ameroid constrictors are made up of hygroscopic casein surrounded by a stainless steel ring. The casein gradually absorbs peritoneal ﬂuid and expands to constrict the anomalous blood vessel. In a study by Vogt et al (1996), 6 of 12 dogs completely attenuated in one month and an additional 3 of 12 in seven months. One notable complication is kinking of the shunt vessel after ameroid placement. This has been documented especially with smaller shunts when the ameroid changes position and causes an acute rise in portal pressures leading to acute portal hypertension. More recently cellophane bands have been employed for extrahepatic shunt ligation. These bands are made of plant cellulose (Fig. 3). They are inﬂammatory and cause progressive ﬁbrosis around the ligated shunt vessel. These bands are easily sterilized and stored, and are also light in weight making abrupt attenuation of the shunt due to implant movement unlikely. It also appears that following application of a cellophane band there is more slowly progressive attenuation of the shunt vessel. Fig. 4: Lateral radiograph following Percutaneous Transvenous Coil Embolization of a left divisional intrahepatic shunt, with placement of an endovascular stent in the caudal vena cava, and thrombogenic coils at the shunt anastamosis. Intrahepatic shunt ligation is challenging from a traditional surgical approach, as hepatic parenchymal dissection is required, and risk of hemorrhage is signiﬁcant. 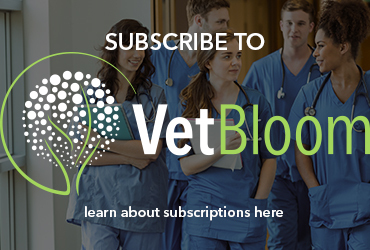 A minimally invasive, interventional, endovascular technique has been developed in dogs. As described above, all patients are recommended to undergo medical management prior to shunt correction. Percutaneous transvenous coil embolization (PTCE) is performed to attenuate intrahepatic shunts under ﬂuoroscopic guidance. A CT-portogram is ﬁrst performed to characterize shunt morphology and assess caudal vena cava (CVC) diameter. Venous access into the intrahepatic CVC is made via a percutaneous transjugular approach with catheters and guidewires. The communication of the shunt and CVC is deﬁned with direct intravenous contrast administration. An indwelling permanent vascular stent is placed in the lumen of the intrahepatic CVC bridging the opening of the shunt communication. Thrombogenic coils are then placed in the shunt to gradually attenuate shunt ﬂ ow, while monitoring portal pressures. The coils are maintained in position and prevented from dislodgement by the indwelling caval stent (Fig. 4). The major post-operative complication of concern is the development of seizures. Onset of seizures may be related to hypoglycemia, persistent hepatic encephalopathy, or as shown in a small percentage of cases, it may be related to the acute removal of endogenous benzodiazepines and/or acute changes in brain amino acid concentrations or ratios. Some evidence exists that employing anti-convulsants prior to surgery may help lessen the severity of clinical signs however it does not reduce the overall risk of developing neurologic signs postoperatively. If seizures do occur postoperatively both propofol and phenobarbital may need to be employed with the hope that anti-convulsant therapy will not need to be continued long term. Neurologic complications can be severe and some patients can take weeks to recover, and may ultimately have residual neurologic signs. Hypoglycemia and hypothermia can be seen as post-operative complications, but with appropriate monitoring these are preventable. As previously discussed portal hypertension can also develop, and may be mild, moderate, or severe although this is uncommon. The more severe cases may present with vomiting, abdominal distension, progressive ascites, pain, as well as hypotension. In some cases immediate removal of the device may be needed if the patient doesn’t respond to medical intervention. Prognosis can be poor with these patients. Persisting clinical signs consistent with portosystemic shunting may be seen in some patients. Considerations for this complication would be persisting shunting, additional congenital shunts not ligated, acquired shunt development, or underlying concurrent hepatic disease. Medical management with protein-restricted diet, antibiotics, lactulose and hepatoprotective supplements is recommended until liver function demonstrates improvement, both clinically and on blood work. Blood chemistry evaluation should be evaluated 1 month after surgery. If values have all normalized weaning of medications can be started over a period of 1 month. At 3 months, a bile acid panel should be completed. If they are still moderately increased, re-evaluation should be scheduled 6 months after surgery. In patients with intrahepatic shunts, the likelihood of persisting shunting may be increased, and as such, weaning of medications is recommended to be based more on clinical signs. Weaning of medications starts with stopping metronidazole, then lowering lactulose and ultimately transitioning to a maintenance dog food. Antacid therapy is recommended life-long even if other medications are discontinued successfully. Watson et al in 1998 published a study evaluating medical management only for patients with intra- and extrahepatic shunts. The majority of patients in the study were diagnosed with intrahepatic shunts (17/27). 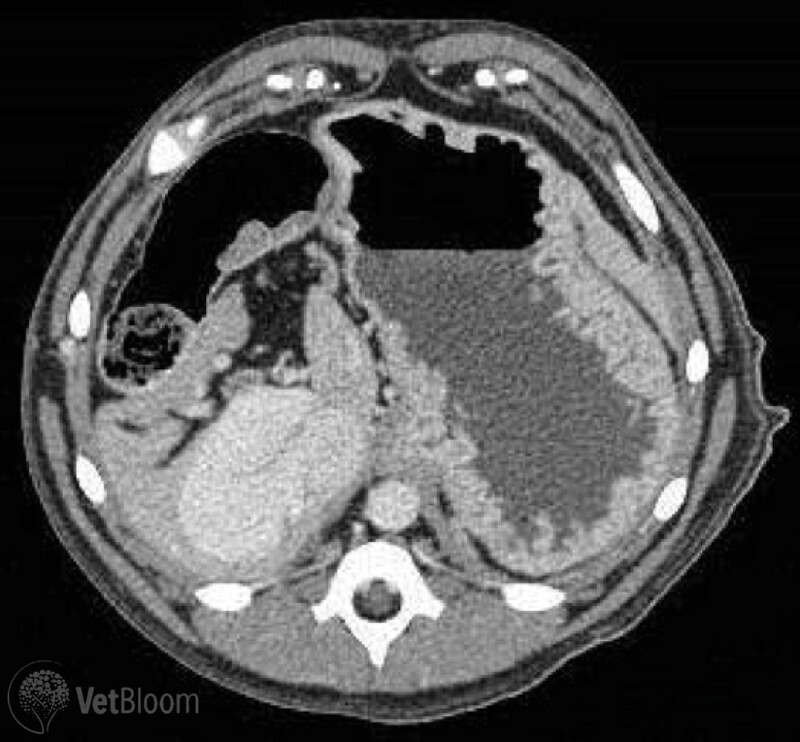 Nine of 27 patients were diagnosed with extrahepatic shunts (1/27 dogs was diagnosed with a complex shunt and omitted from evaluation in study). The median age was 20 months and the median survival time was 9.9 months with euthanasia occurring within 10 months of diagnosis. However also to be noted in this study was that patients not euthanized during the study time period had a mean follow-up period of 56.9 months with those patients being alive 36 months after diagnosis. In general patients with intra-hepatic shunts are more difﬁ cult to manage long-term medically. Prognostic indicators for having a longer survival include age and a higher BUN. In another recent study, Greenalgh et al evaluated long-term survival and quality of life in dogs with clinical signs associated with a congenital portosystemic shunt after surgical or medical treatment. In this study, 27 of 124 dogs were treated medically. Median survival in this study was 836 days. Owners overall felt that patients had a good quality of life although it is important to counsel that there would be ongoing clinical signs, liver dysfunction is progressive, there will be a need to adjust medications, and that hospitalization may be needed if a crisis develops. In general, complication rates for gradual occlusion devices with extrahepatic portosystemic shunts are about 10% with a low mortality rate of <10%. There is a good to excellent outcome in the majority of patients. Weisse et al reported intraoperative complications of 3% and postoperative complications of 13% for endovascular treatment of intrahepatic shunts. In the study by Greenalgh et al, owners saw a signiﬁcant improvement in the surgically managed patient group. Ongoing treatment may be necessary, but this improved over a longer follow up time period. Also, some patients remained on some management, especially dietary, due to owner preference. Overall, the Greenalgh study showed a better survival rate and also better quality of life when surgical intervention is pursued. This is based on reduced number and frequency of clinical signs post surgery. It is however also important to note that patients managed medically can have a good quality of life, not just for months, but also years. D’Anjou MA, Penninck D, Cornejo L, et al. Ultrasonographic Diagnosis of portosystemic shunting in dogs and cats. Vet Rad Ultrasound 2004;45:424-37. Ettinger et al. Textbook of veterinary internal medicine, 7th ed, 2010. Greenhalgh SN, Reeve JA, Johnstone T, et al. Long-term survival and quality of life in dogs with clinical signs associated with a congenital portosystemic shunt after surgical or medical treatment. J Am Vet Med Assoc 2014;245:527-33. Lamb CR, Forster-van Hijfte MA, White RN, et al. Ultrasonographic diagnosis of congenital portosystemic shunts in dogs: Results of a prospective study. Vet Rad Ultrasound 1996;37:281-8. Landon BP, Abraham LA, Charles JA. Use of transcolonic portal scintigraphy to evaluate efficacy of cellphone banding of congenital extrahepatic portosystemic shunts in 16 dogs. Aust Vet J 2008;86:169-79. Vogt JC, Krahwinkel DJ Jr, Bright RM, Gradual occlusion of extrahepatic portosystemic shunts in dogs and cats using the ameroid constrictor. Vet Surg 1996;25:495-502. Watson PT, Herrtage ME. Medical management of congenital portosystemic shunts in 27 dogs – a retrospective study. J Small Anim Pract 1998;38:62-8. Weisse C, Berent AC, Todd K, et al. 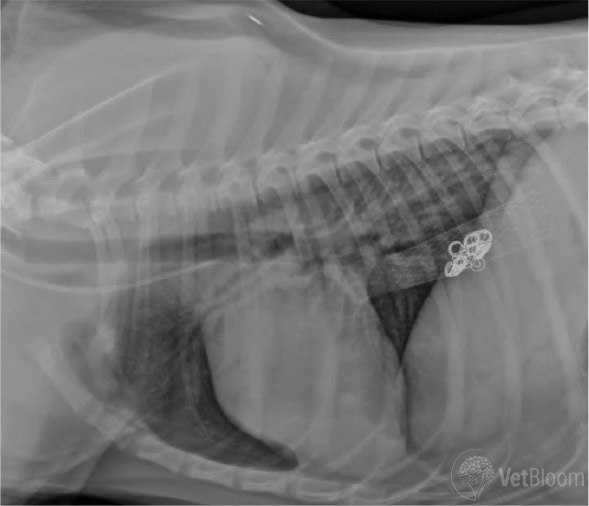 Endovascular evaluation and treatment of intrahepatic shunts in dogs: 100 cases (2001-2011). J Am Vet Med Assoc 2014;244:78-94. Non-invasive mitral valve replacement in dogs…is a viable option on the... Conjunctival cytology: A great diagnostic tool you’re probably not using!